The S&P 500 Index trades at a Shiller PE Ratio of 29.34. This is a level only surpassed by the levels in 1987 – prior to Black Tuesday – and the dot-com bubble. U.S. Treasury bond yields remain near historical lows, with real yields (nominal yield less the inflation rate) barely above zero at the intermediate portion of the curve. Many investors have missed the dual rally and remain under invested in hopes of a great unwind. And so the critical question at hand for us and many bond investors remains: how does one sensibly invest in today’s bond market? We recognize the seemingly endless state of the present day market’s paradigm (high valuations) and the conundrum it engenders for municipal bond investors. But we disagree with those that assert the answer to the question at hand is “sitting on” large cash balances in order to “time” the bond market. We have written on this topic frequently and extensively over the years. See 2014’s The Problem with Waiting for the “Fed” to Raise Rates or 2010’s “The Cost of Waiting”. Our theme on this topic has been unwaveringly consistent: the cost of waiting (i.e. market timing) comes with a large opportunity cost and is a difficult task. 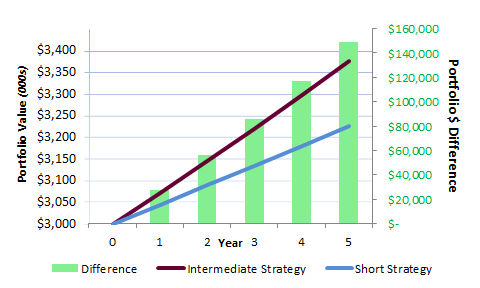 Depicted below is the growth of a portfolio adhering to our Intermediate Strategy compared to our Short Strategy over the last five years. A difference of less than one percent annualized rate of return between the two strategies, yields a dollar difference of almost $150,000 on a $3,000,000 portfolio. This example demonstrates both the power of compounding and the danger in waiting for the ”right hand” in today’s market. That question posed, there a number of indicators that hint at higher levels of future economic growth. The unemployment rate is near a decade low 4.67%, there are bright spots within demographics and population growth (women in their 30s are giving birth at the highest rate since the 1960s), and paradigm shifting innovations are gaining hold (e.g. driverless cars, immunotherapy to help cure cancer, or even the billionaire-catalyzed space-race). These items suggest higher growth/productivity in the future, i.e. higher rates, and your portfolio should remain conservative from a duration standpoint. How does this all impact our approach? 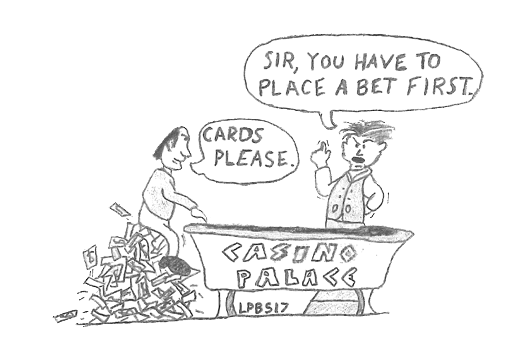 First – we do not attempt to guess whether going all in or waiting for a better hand will be the best bet. Frankly that is impossible to predict from market cycle to market cycle, in our view. This strategy comes to fruition through our laddered approach to maturity selection, where market timing is secondary to bottom up credit analysis and individual security selection. This approach is especially relevant and valuable in the nuanced and arcane municipal bond market where expertise and specialization often uncovers value (i.e. higher yields on solid credits). Secondly, but not any less important, we invest your portfolio as a separate account, giving you control of the underlying assets with predetermined maturity lengths. Call it your own, solely-owned mutual fund, without the interference of outside investors directly bidding up or down your asset and the transparency of knowing what you own and when it cash flows. That is our traditional approach to the market, and the investors that have stuck with it through times of crisis and expansion, have benefited mightily. This time is very different but your approach should remain the same.